This cottage style birdhouse comes stocked with three interchangeable, seasonal decorative items. Celebrate spring and summer with a sunflower, fall and Halloween with a jack-o-lantern, or winter and Christmas with a Christmas tree. 8 in. x 6 in. x 10 in. 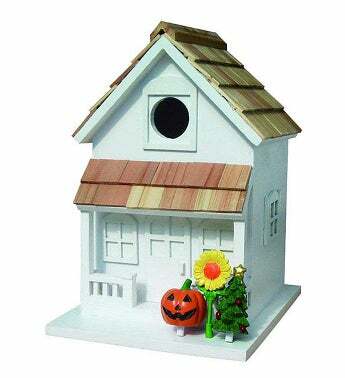 This cottage style birdhouse comes stocked with three interchangeable, seasonal decorative items.